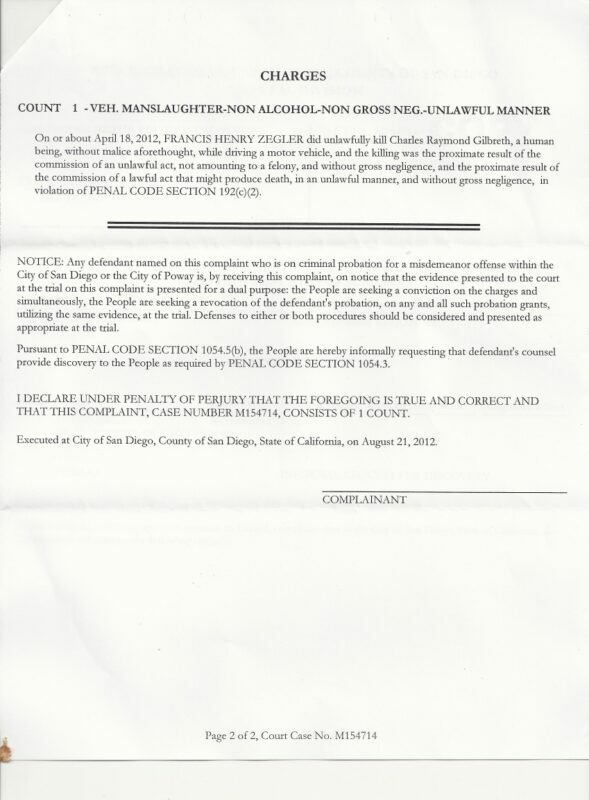 Last June we learned that the SDPD investigators had recommended criminal charges against the driver responsible for the death of Chuck Gilbreth. 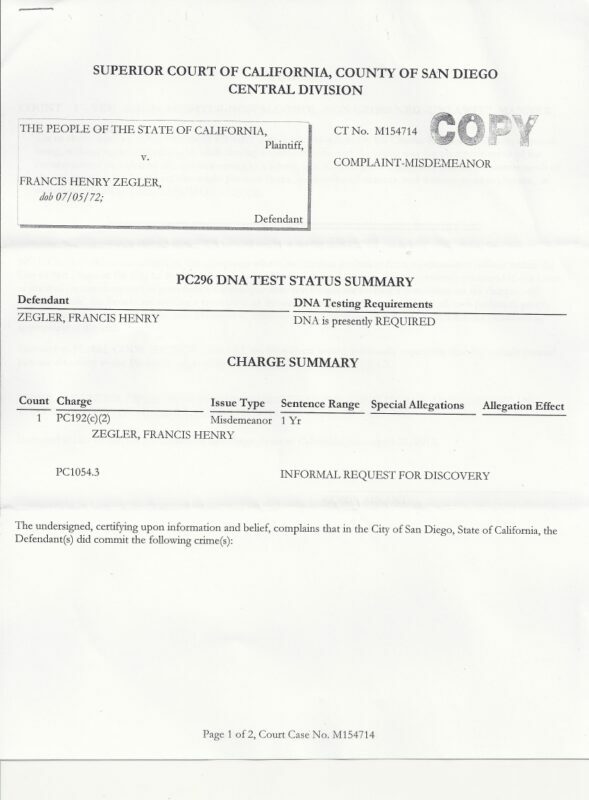 The City is now pursuing vehicular manslaughter charges against Francis Henry Zegler, the driver who killed Gilbreth. A jury trial is scheduled for February 25th. 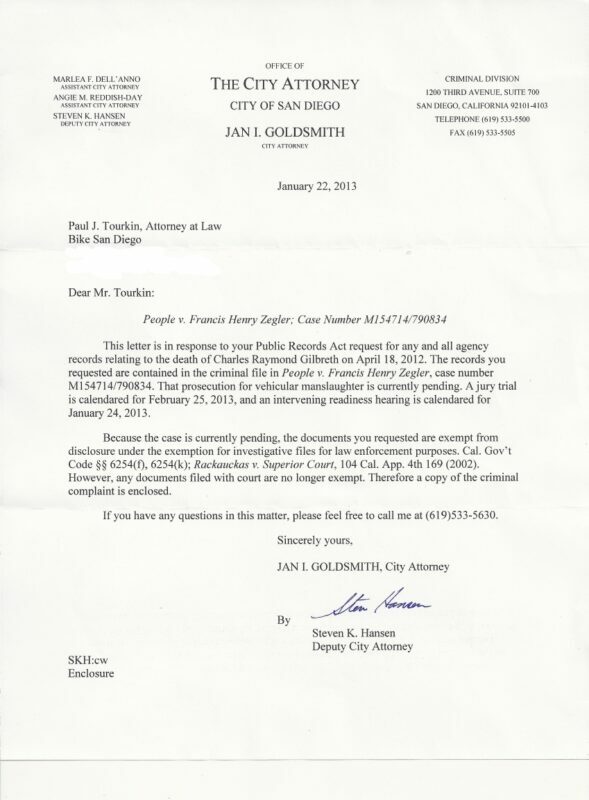 Below is a copy of the letter from the City Attorney's Office to us, along with the summary of charges. We don't have any more information but will keep you updated as we learn more. Why has the green bike lane on Montezuma Road been scrubbed away? Since earlier this month, we've been receiving lots of emails that the green painted section of a portion of the bike lane on Montezuma Road has been scrubbed out. Many of our readers were not in favor of the green painted section because they didn't address the key issue that has resulted in fatalities and injuries along Montezuma Road - the high speed differential between vehicles and bicycles. Those who were in favor of the green painted bike lanes fell into the "it's better than nothing" camp of thinking. Putting vehicles traveling at or above 55 miles an hour alongside slower vehicles traveling at under 20 miles an hour with no road treatments to account for something human beings do all the time - make mistakes - creates dangerous and deadly conditions. We weren't thrilled about the green paint because it didn't address the key issue we were trying draw attention to - motor vehicles traveling at high speeds on Montezuma Road alongside slower moving bicyclists. According to our new friend, Brian Genovese at the Multi-Modal division, Genovese stated that some cyclists were observed changing lanes to enter the diagonal section without looking behind to see if there was oncoming traffic. We're still pushing for some substantial treatments along Montezuma - treatments that provide a measure of physical barrier between people moving at different speeds. We've been working with Councilmember Emerald's office on this issue and we'll keep you updated as this moves along. And we hope that the new treatments that Genovese and his staff is working on addresses this key point. Update: Head over to KPBS and read more about this issue. At this point, it’s a matter of finding the money and the political will to create them. Cycle tracks are fairly uncontroversial in the cycling community, though some bike riders say they still want access to the primary road the cars drive on. [...] As for money, the local planning agency SANDAG has set aside $2.58 billion for bike and pedestrian projects from now until 2050. The only thing cities need to do is apply for the money. What are your thoughts on the subject? Where else would you like to see protected bicycle infrastructure such as cycle tracks installed in the city? Have you ridden on cycle tracks in other cities? Share your experiences here. Last night nearly fifteen riders packed the College Area Community Council Meeting room to support our efforts to redesign Montezuma Road to be safer for bicycling. One of the items on the meeting agenda was a presentation by City staff on improving bicycle safety on Montezuma Road. Last night's presentation was the culmination of an effort we initiated with Councilmember Marti Emerald and her staff after Chuck Gilbreth was killed on Montezuma Road earlier this year. Brian Genovese, Senior Traffic Engineer of the newly formed Multiple Modal Division made the presentation summarizing the results of the study that his department had conducted. The Multi-Modal Division, according to Genovese, is the reorganized Transportation, Engineering and Operations Division where the emphasis is to aggregate the Complete Streets focus and to address the transportation needs of all modes of travel and "do more than before". His department looked at the College Area Community Plan which was last adopted in 1989 prior to beginning their study of the conditions on Montezuma Road. Bicycle Collisions on Montezuma Road between 1999 - 2012. Source: City of San Diego. Genovese presented solutions for low cost/low effort that could be implemented much sooner under what he later articulated as an O&M (or Operations and Management) effort as opposed to a Capital Improvement program which would be a lengthier process as it would entail extensive public outreach. The short term solutions varied from keeping the existing bike lane free of debris, painting bike boxes, implementing other types of colored pavement markings, not removing the few spots of curbside parking and reconfiguring the interchanges through paint. The next steps proposed included having pilot projects, doing before and after studies after implementation and to coordinate with the "very aggressive" street overlay program to ensure that the overlays included the needs of bicycle riders. The long term solutions included installing a cycle track , removing curbside parking and having grade separated facility pop outs. Other recommendations included putting in signs to "share the road" or "ride with traffic". The first comment after Genovese concluded his presentation came from a Committee member on the College Area Community Council who shouted that the city was "presumptuous that they could change behavior rather than provide cycletracks or safety." The Chair, Doug Case, refocused the discussion by stating that he had received multiple emails in support of cycle tracks on Montezuma Road. He didn't know what they were and Genovese explained what they were. Joan Fitzsimons asks for Class I bike path along Fairmount Avenue drawing smiles and cheers from the crowd. The discussion was then opened to the visitors and one of the first people to offer comment on the City's presentation was Tom Fudge who was seriously injured on Montezuma Road. He started by saying, "paint is great but paint doesn't stop cars." He went on to request that the city "find some way to separate cars from bikes"
Forrest Brodsky who is the President of The Bike Stand, the SDSU bike advocacy group, lamented how his group's efforts to have SDSU recognized by the League of American Bicyclists for being a bicycle friendly campus "failed miserably primarily because of Montezuma." Joan Fitzsimons a resident of City Heights stated that she wanted to see a "complete transformation of Fairmount Avenue into a Class 1 bike path." Fairmount Avenue is one of the three main routes to travel into the valley by bicycle and we believe that it is designed to be extremely unpleasant to ride on. Fairmount Avenue is a connector to Montezuma Road. At this point the discussion got a little rowdy and it was hard to follow who was saying what. One Committee member voiced support for banning cars from driving on Montezuma altogether which received a fair bit of applause and more chatter until the chair, Doug Case, called the meeting to order. Jan Riley who sits on the College Area Community Council was also appalled at the short term solutions being proposed by the City. Jan Riley (second from left) expresses her disapproval of the proposal. She stated that cyclists needed "physical separation" and that it could be done cheaply in the short term by means of "plastic cones". She went on to state that a "little sign doesn't help" and suggested that the City do something get drivers to pay attention. She also suggested to "remove parking all along Montezuma" which was also received with cheers and applause and seconded a comment given by a previous Committee member. She ended her comment stating that Montezuma "is dangerous." The Chair, closed the discussion by stating that Committee's highest priority in their Capital Improvement Project list was improving bicycle and pedestrian safety on Montezuma Road. The presentation was offered as an information item and this item ended after the Committee asked to be included in the process of improving Montezuma Road. Genovese stated he would do so. Overall, we were pleasantly surprised with the incredible support we received from the College Area Community Council and the requests they made. The other visitors who spoke up also voice similar support as articulated above, but we didn't capture the specific quotes for our write up. We hope the City will speed up the process of getting dedicated and protective bicycle infrastructure built on Montezuma Road, especially in light of the incredible support received from the Community Council and the bicycle community. Tomorrow's the College Area Community Council Meeting will begin with a feature presentation by Brian Genovese, Senior Traffic Engineer, Multiple Modal Program, Transportation Engineering Operations Division, City of San Diego. Our main ask is to ask the city to reduce the speed limit on Montezuma Road in order to make the road safe for all users, by building protected bicycle facilities such as cycle tracks to tame the traffic on Montezuma Road. How to get there: If you want to ride to the meeting location, meet us after work at Blind Lady Ale House and we will ride to College Rolando Library doing our best to avoid high speed Montezuma Road to get to the meeting location. We leave Blind Lady at 6pm. RSVP here. If you want to get there on your own, plan on being at the library and seated by 7pm as the presentation is scheduled to begin at the very beginning. The area that the Community Council oversees can be seen in this map which covers Montezuma Road between Fairmount Avenue and the road slightly east of 70th Street. As of today the speed limit on Montezuma ranges from 50 mph at Fairmount Avenue to 35 mph as one heads east. Given that there is a speedy thoroughfare designed for drivers exclusively (I-8) that already exists less than a mile north of Montezuma Road - there is absolutely no reason for Montezuma Road to also serve as a high speed thoroughfare for drivers. Montezuma Road with the I-8 (in blue) to the North. The speeding issue is also substantiated by the San Diego Police Department who handed out over a tenth of the speeding tickets at College Avenue between El Cajon Boulevard and Montezuma Road. As you may have heard, we are working on a corridor study that will include recommended low-cost-low-effort early action treatments. Separated cycle tracks or raised bike lanes will be considered but will likely fall into the category of higher-cost-higher-effort treatments. In Voice of San Diego's analysis of low income communities, Montezuma Road also lies in the section of the city that has a high percentage of low income residents. Given our review of where protected bicycle facilities have been implemented in the city of San Diego over the last decade, this community is long over due not only for safety improvements but also for protected bicycle facilities that benefit the community. As a bicycle rider who wants safe thoroughfares for all road users, I respectfully ask that the Council vote to support protected bicycle facilities such as cycle tracks on Montezuma Road. 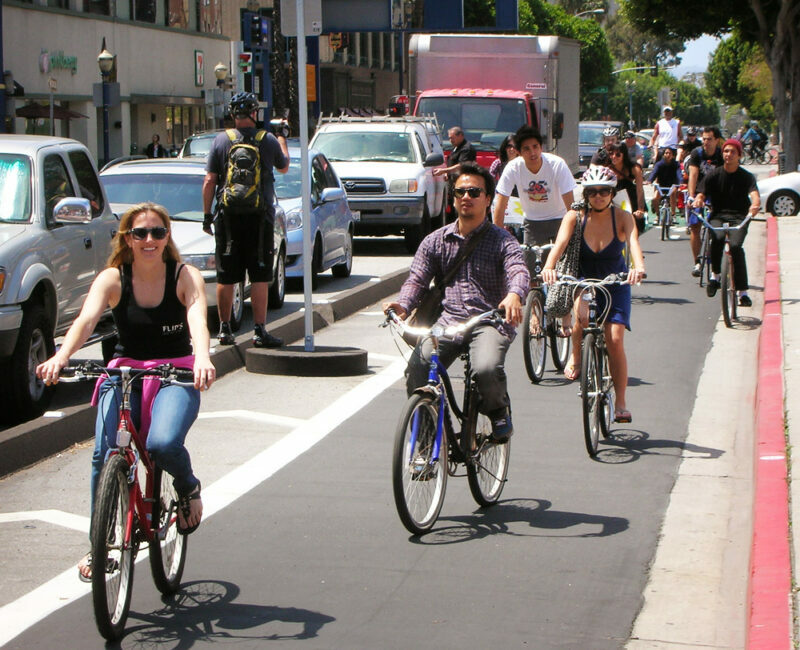 Update: A reader pointed out that San Diego already has a precedence for adding protection for bicycle riders in order to lower speed limits and traffic calm high speed roadways. The main reason we are requesting protected bicycle facilities is to further narrow the travel lane and thus trigger a speed survey that we hope will result in a lower speed limit along Montezuma Road.